Usha Naidu is a recently retired educator and freelance journalist. 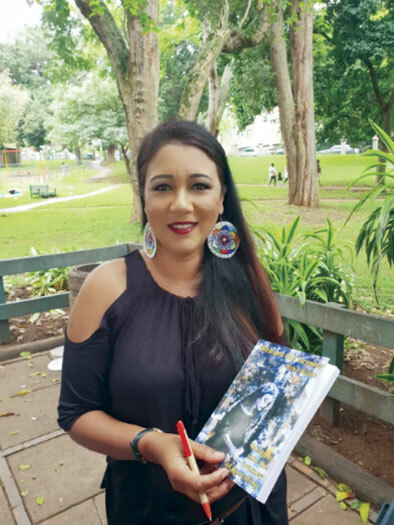 Naidu’s teaching career spanned 28-years where she taught at Clairwood High School, Glenwood High School as well as Eden College. Her career in journalism began in 2001 with community interest stories. She wrote a weekly column for Tabloid Newspapers called Usha Uncut. Naidu has travelled extensively around South Africa, Africa and the world, having visited more than 50 countries. Her most memorable vacations have been to Russia, Namibia and to the Florida Keys in the United States. She recently released a book called “Behind the Scenes, Insights into the Journey of Parenting” which she hopes will stimulate discussion around parenting issues and bring about awareness of the damage that parents can do to their children if they lack the capacity to own up to and introspect on their actions. Usha spoke to Chatsworth Tabloid about her life, passion and the inspiration behind her book. Please describe your upbringing and relationship to the Chatsworth community? I grew up in Chatsworth, living first in Moorton where I attended Moorton Heights Primary School then went on to Asoka Secondary. My parents moved around a lot once I became a teenager and I then moved to Southlands Secondary, my alma mater. I spent a fair amount of my formative years living in Havenside. Unfortunately, we were not well off, so we lived mostly in outbuildings, which were tiny, cramped and damp so I do not have fond memories of the places I lived in. What I do have fond memories of, is the sense of community in Chatsworth. I credit Chatsworth with keeping me humble and grateful for everything I have achieved in life, for keeping me rooted and grounded and for making me streetwise and savvy. Also the entrepreneurial streak I have, was awakened in Chatsworth where everybody is engaged in some entrepreneurial activity or the other. CT: What are some of your favorite things about Chatsworth? UN: Undoubtedly the Bangladesh market. I love the energy and the vibe that surrounds this market, the sights and sounds, the smells and tastes…this market is an onslaught on the senses and I love it! I love the vibrance of Chatsworth, this place is a hive of activity and energy, from the taxis to the guys revving their cars to the roadside fruit sellers, to the thriving businesses in the most unlikely commercial spaces, like someone’s garage up on the roadside! In the midst of this insanity, lies the tranquillity of the Sri Radanath Temple in Unit 6, with its lovely vegetarian cuisine. I love the way you can strike up a conversation with anybody in Chatsworth and they will respond eagerly, there is a brotherhood and sisterhood of association just by being in Chatsworth. I love that you are completely accepted in Chatsworth and can enter and leave the community at will, with no judgement that you now reside elsewhere…you will always be welcomed. CT: You have been a journalist for a long time what are some of the highlights of your Journalistic career and what did you like about Usha Uncut? UN: I have loved being a journalist as I am always highly opinionated and this gave me an outlet to voice my opinion. Plus the reach of journalism is vast and often unexpected. It is heartening when you learn that you have followers of your writing in unexpected places like the sleepy village of Underberg, and then you hear that you have online readers of your work in London. One of the highlights of my career was when I had columns running in two daily newspapers and two weekly newspapers in Durban at the same time. Of course this meant working till the late hours on these columns, really too ambitious for a busy teacher, mother and housewife but the challenge to the self was irresistible. Usha Uncut gave me a chance to make comment on society and shine a spotlight on common behaviours that were stunting people’s spiritual growth. The articles contained hard hitting commentary but with a motivational slant and an invitation to introspection on the topic being discussed. No topic was taboo, from Indian weddings to school fees at ex-Model C schools to attitudes towards daughters-in-law. The title Uncut, gave me licence to say it as it is. CT: Many feel that journalism is a dying profession. Do you agree, why or why not? UN: Sadly, I have to agree. The tenets of article writing says it all. The first three lines must contain all the important details as people barely read beyond these first three lines. CT: What was the inspiration behind your book? UN: The book is a compilation of columns which I wrote for a leading Durban daily newspaper and which appeared weekly, over a period of a year and a half, on the topic of parenting. This topic was close to my heart as I am a parent of two children myself and being a teacher, was in loco parentis to hundreds of children each year. I found that very often, the behaviour of children in the school environment could be traced back to irresponsible parenting. I found that the child who arrived in class exhausted every morning and slept through the first three lessons, was actually the victim of a laissez faire parenting style with very few boundaries, that saw the child being allowed to stay up all night playing Playstation games instead of sleeping. I saw the children of wealthy professional parents with high performing jobs being left at school till 6pm, for teachers to babysit while they focused on their careers to the detriment of their children. There were many instances where the parents were damaging their children unconsciously and this prompted my columns on these issues of parenting. The columns, now compiled into the book were written with the hope that parents look at the case scenarios presented, recognise themselves, introspect and change their behaviours if they were guilty. CT: Now that you are retired from teaching, how do you spend your time? UN: I run an antiques business that keeps me busy and I enjoy traipsing across the country and overseas looking for stock. I love interior decorating and design, I did a course in this a few years ago and this is my passion so when I am not assisting in decorating by using items from my stock, I attend trade fairs and learn as much as I can about the latest trends. I belong to a Literary Circle which keeps me busy and engaged with the world of writers and writing. I give motivational talks, on the topics of reading and writing, life and its lessons and parenting, amongst others and of course, I write, both articles and now a book. I have the second book on the series in the pipeline. CT: You are quite a well-travelled person. Which areas do you suggest that Chatsworth residents should visit during their lifetimes? Town awaits a whole new world of beautiful landscapes and exciting things to do. The West Coast Wild Flower tours are a must-do, when carpets of daisies fill every available spot of ground during the rainy season. Our country has as much to offer as any overseas country, but if planning an overseas trip and you have not been to India, then I encourage everyone to go, if only for the spiritual awakening that awaits them.